Northern Cardinal, Chipping Sparrow, and White-breasted Nuthatch. Photo by Brian Maltzan via Birdshare. The ideal bird feeder is sturdy enough to withstand winter weather and squirrels, tight enough to keep seeds dry, easy to assemble and, most important of all, easy to keep clean. To cater to nectar-loving birds, see our section on hummingbird feeders. We also have tips on where to put your bird feeders to help keep birds safe. House Finches at a platform feeder. Photo by Susan Spear/Cornell Lab. Trays attract the widest variety of seed-eating feeder birds, including pigeons, starlings, and House Sparrows, but also grosbeaks and native sparrows. Tray feeders offer no protection against rain and snow; without excellent drainage, seeds may become wet enough to sprout, and wet seeds may also foster fungal and bacterial growth. Bird droppings can quickly soil the seed in tray feeders. The best tray feeders have a screened, rather than solid, bottom to promote complete drainage; at the very least, tray feeders should have several drainage holes. Even with drainage, the bottom should be removable for fairly frequent hosing. Offer only enough seed in tray feeders for birds to finish every day or two, and shake out the bottom every time you add new seeds. Unless constructed with an effective squirrel baffle on the pole or suspension chain, tray feeders are an open invitation to squirrels and chipmunks. Tray feeders placed near the ground are most likely to attract ground-feeding birds such as juncos, doves, jays, blackbirds, and sparrows (along with squirrels, deer, raccoons, and other critters). Tray feeders can also be mounted on deck railings, posts, or stumps, or can be suspended. Some models have a roof to provide some protection from the weather. Gray-crowned Rosy-Finch by Ron McCluskey. This kind of feeder protects seeds fairly well against the weather and bird droppings, but if the seed within the hopper does get wet, bacteria and fungus can thrive. 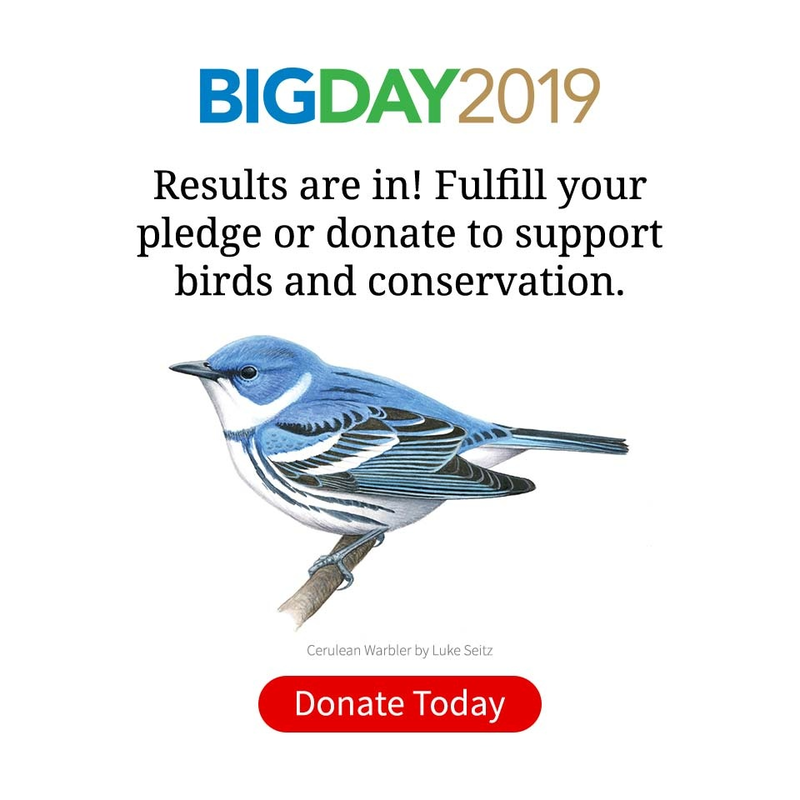 Hopper feeders are attractive to most feeder birds, including finches, jays, cardinals, buntings, grosbeaks, sparrows, chickadees, and titmice; they’re also squirrel magnets. Many hoppers can hold enough seed to last for several days, which can make them very convenient for people, but dangerous for birds if the seed within is allowed to get wet. Most hopper feeders are much harder to clean than tray feeders. Hopper feeders can be mounted on a pole or suspended. Again, a squirrel baffle is important if you don’t want to feed them. Small plastic feeders affixed to window glass with suction cups, and platform feeders hooked into window frames, attract finches, chickadees, titmice, and some sparrows. They afford us wonderful, close-up views of birds, and their placement makes them the safest of all feeder types for preventing window collisions. 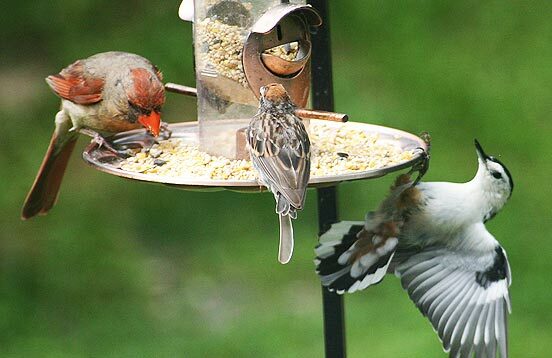 Because many birds feed while standing on the seeds in window feeders, the food risks becoming soiled, so the seed in these feeders should be changed daily and the feeders kept very clean. Fortunately, for most window designs these are the easiest of all feeders to access for filling and cleaning. Hollow tubes keep seed fairly clean and dry and, if they have metal feeding ports, may be somewhat squirrel resistant (though squirrels often chew through the end caps or the plastic tube itself). 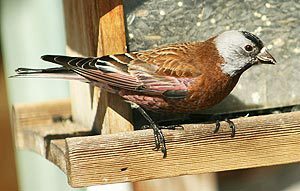 Depending on the size of the perches under the feeding ports, you may attract small birds such as sparrows, grosbeaks, chickadees, titmice, and finches while excluding larger species such as grackles and jays. Styles with perches above the feeding ports are designed for seed-eating birds that can feed hanging upside down, such as goldfinches and chickadees, while dissuading others. Depending on the size of the feeding ports, you can offer tiny nyjer seeds or larger seeds. Unfortunately, the seed-containing tube on most tube feeders extends an inch or more below the bottom-most feeding ports. Seed that collects here may become a breeding ground for mold and bacteria. It’s best to block the bottom of the tube below the bottom feeding ports. Some tube feeders are huge, accommodating a dozen or more birds at a time. But these are best used only during times when many birds are using them. During periods when only a handful of birds use these feeders, use smaller models so the seed is used up fairly frequently. When adding new seed to tube feeders, always empty the old seed out first. 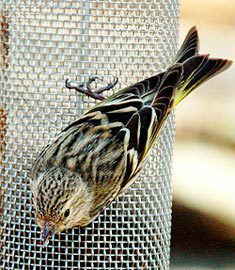 Nyjer (also called thistle) feeders are especially popular with American Goldfinches, Pine Siskins, and Common Redpolls. They come in two forms—tube feeders with very small feeding ports, and “thistle “socks”—fine-mesh bags to which birds cling to extract the seeds. The seed within thistle socks can become quite wet with rain, so only use large ones during periods when you have enough finches to consume the contents in a few days. The same caveats are true of nyjer tube feeders as other tube feeders. Many people look below their nyjer feeders to see what looks like wasted seed beneath. As tiny as nyjer seeds are, the black part on the outside is merely the shell—finches slit through this to extract the even tinier seed within. Squirrels aren’t particularly attracted to nyjer seed, so normally don’t damage even fairly flimsy plastic nyjer feeders. Suet feeders attract a variety of woodpeckers, nuthatches, chickadees, titmice, jays, and starlings. Suet cages that open only at the bottom force birds to hang upside down while feeding. This design usually excludes starlings, which have trouble perching that way. Some people are concerned about metal suet feeders, afraid bird tongues or eyes can stick to the metal. Although anecdotal information about this actually happening is scarce or nonexistent, it’s easy to find plastic-coated suet cages. In rare situations, bird toes have become entangled in mesh onion bags, leading to the bird’s death if someone doesn’t notice and release the bird quickly. Suet cages are probably a safer way of offering suet. Some people drill holes in small logs for spooning rendered suet (or peanut butter) into. And some people put peanut butter or suet in crevices of tree bark, too.